The Endurance T10HRC treadmill is manufactured by BodySolid, which is a well-respected maker of strength training equipment. Home gym owners are aware that BodySolid backs all its equipment with the best warranty in the business, treadmills included. The downside, however, is that their treadmills are overpriced. The Endurance T10HRC treadmill has a bright LED readout of time, distance, speed, elevation, and calories burned. It supports users up to 350 pounds and includes heart rate control monitoring. BodySolid decided a few years ago to get in on the cardio fitness market by putting out a line of treadmills priced from $1,300 to $3,500. They are built with quality components, a solid frame with no wobble even for heavier individuals, and an attractive design. The company includes the same lifetime warranty on all treadmills as it does for home gyms, but since the warranty must now cover electronics and motors, instead of weight plates and cables and pulleys, the price on the treadmills is sky high. The best thing owners of an Endurance T10HRC have going for them is that it is made by a prominent fitness equipment company. It is a good thing too, that BodySolid stands behind their products, because they had a huge treadmill recall in 2006 with the T7, T8, and T9 models to repair a defect in sudden acceleration. 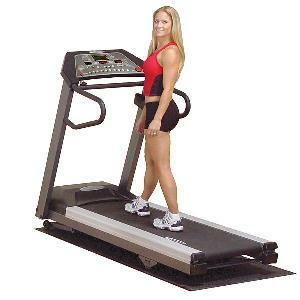 Treadmill reviews by customers are generally upbeat about their machines, and rate it well for running area, deck cushioning, quality components in the rollers & belts, and a quiet ride. But the recall issue makes the reliability of these treadmills questionable. 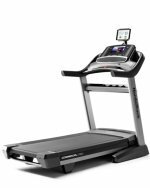 With an MSRP of $3,595, the best the Endurance T10HRC treadmill can boast about is having one of the absolute best warranties in the business: bumper-to-bumper lifetime on everything, with labor costs covered the first year. Otherwise, it is an average treadmill that won’t hold your interest for long once you see what other models in this price range have to offer. If you plan to spend around $3,000 for a machine, you will get a better value by going with a PaceMaster, FreeMotion, or Landice.